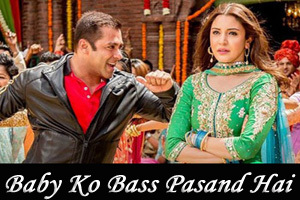 A dance song sung by Vishal Dadlani, Badshaah, Shalmali Kholgade, Ishita featuring Anushka Sharma, Salman Khan. The video of this song is available on YouTube at the official channel YRF. This video is of 2 minutes 34 seconds duration. The lyrical video of this song is also available on YouTube at the official channel YRF. This video is of 4 minutes 15 seconds duration. Lyrics of "Baby Ko Bass Pasand Hai"
Lyrics in Hindi (Unicode) of "बेबी को बेस पसंद हे"